There's hiking, trekking, sports climbing, bouldering, classic mountaineering, via ferrata, trail running, and biking. The possible uses of a high-quality Windstopper jacket are as varied as mountain sports itself! The weather can change unexpectedly during a pleasant mountain hike. That's when you should put on a jacket. The effect of wind chill lowers the apparent temperature by a few degrees, even if it isn't too cold to begin with. If you have the proper wind protection, things will soon look much different when you're on the go. A windproof jacket is essential for every type of outdoor sport. Breathable models are ideal for active, strenuous uses. Moisture and excessive heat escape through the fabric. In the meantime, airstreams and icy wind gusts can't get in. Accordingly, all the big outdoor goods manufacturers such as Mammut, Löffler, and Black Diamond have reliable windbreakers in their product line. One thing is true of multi-pitch alpine tours, alpine climbing, jogging, bike excursions, hiking, everyday use, and leisure: A good Windstopper jacket is a simple solution that's more than just practical. Modern windproof jackets aren't just wind-resistant. As the name suggests, they're absolutely windproof and even breathable. Generally speaking, the fabric is also water-repellent. That is, versatile outdoor jackets offer protection from light rain, too. They have a hood and a snug collar on top of that. These protect your head and neck from drafts of air. Why a Windstopper makes sense: Wind affects cold sensitivity! Strong winds make the apparent temperature a few degrees colder than the actual one. A small example: Suppose that the measured temperature is 10 degrees Celsius. Thick tree branches are swaying in the wind (the wind speed is 40 to 45 km/h). The apparent temperature is now a mere 6° Celsius. This effect is stronger at lower temperatures. From 5° C (at the same wind speed) to barely -1° C, it already feels like a frigid -7° C.
Windbreakers have their place in every outdoor tour. They can often replace a hardshell jacket when the weather is dry. This outer layer of clothing is worn over fleece in transitional seasons or over insulation jackets in winter. It's a practical companion that preserves body heat and prevents excessive cooling! Windbreakers work very well as bike jackets. They have a small pack size, they're lightweight, and they fit in a jersey pocket. Alternatively, they take up little space in your cycling backpack. 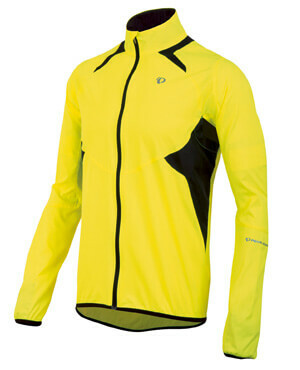 A windproof front and a flexible cut are crucial when using one as a cycling or running jacket. Manufacturers such as Pearl Izumi, Endura, and Dynafit impress with great functional features and practical details. A hood minimizes heat loss through the head. Reflective elements improve safety in poor lighting conditions near road traffic. 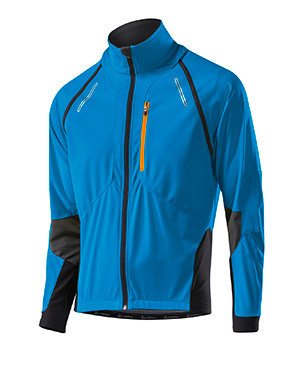 A good wind jacket is also ideal for weekend tours and bicycle commuting.